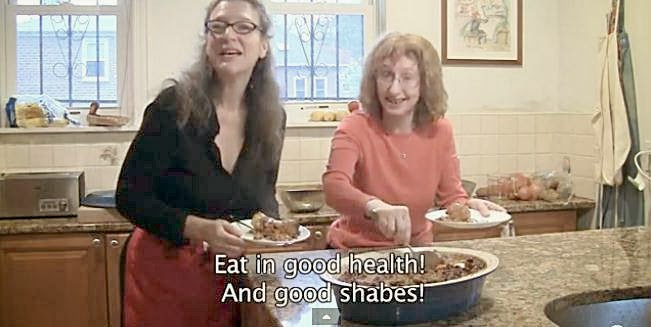 Cholent, the traditional Shabbat casserole of beans, potatoes, meat, and just about anything else gets a vegetarian twist when Rukhl Schaechter and Eve Jochowitz, the conversational Yiddish chefs of the Jewish Daily Forward, combine their cooking talents in another instructional video in the Est Gezunterheit (Eat in Good Health) series. Over the last four years, we've posted 18 of these cooking encounters covering everything from knishes to varnishkes to borscht to kugel to all kinds of holiday meals. Click on "Est Gezunterheit" in the Keywords listing in the left column of this page to link to all of them. In the course of watching these exhibitions of culinary expertise, we've come across some Yiddish words that we didn't know before and we've been sharing them with you. This time it's no different, so check below for a few new words to add to your Yiddish vocabulary. And below the video you'll find the recipe. If I had to eat the Cholent, I would want to kill myself! sorry kids. Is it just ME, or are the pictures of both the Cholent AND the Kugel the SAME? Also, I have to agree with the above......the Cholent would make me gag. Why is the pic of the CHOLENT as well as the KUGEL the same? OY VEY! I am NOT a fan of CHOLENT either.....I rest my case. and isn't it "Ess" for "Eat?" 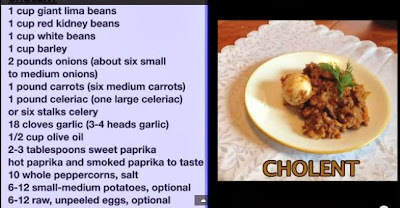 I hope Rukhl or Eve will offer their explanation, but here is mine: The kugel isn't really kugel, but rather a vegetarian kishke that doesn't look like anything but a cylindrical blob (watch the video). I don't know why they repeated the photo. My limited knowledge of Yiddish grammar tells me that "Ess" is what you would say to one person and "Est" is plural. Any Yiddish pros out there? Please confirm or explain otherwise. A Joke to Start the Week - "Brown Bag Lunch"
A Joke to Start the Week - "Dinner Prayer"
A Joke to Start the Week - "Snow White"
A Joke to Start the Week - "Israeli Errol Flynn"
A Joke to Start the Week: "Squeezing the Lemon"